Original animation cel from Disney's 1939 classic ''Pinocchio,'' the follow-up to the first animated film, ''Snow White and the Seven Dwarves.'' This cel shows Pinocchio together with Mister Geppetto and Figaro in the famous ''Jealous Figaro'' scene. 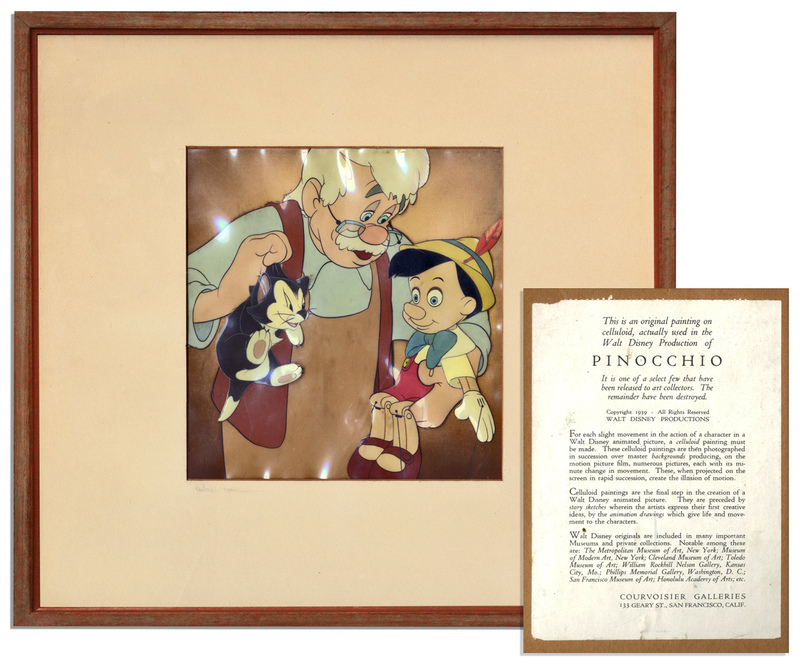 Matted by Courvoisier, the official art gallery for Walt Disney Studios during much of the 20th century, artwork measures 6.5'' x 6.75, framed to 13.5'' x 14.5''. Printed slip affixed to verso reads in part, ''This is an original painting on celluloid, actually used in the Walt Disney Production of Pinocchio. It is one of a select few that have been released to art collectors. The remainder have been destroyed. Copyright 1939...Walt Disney Productions''. Cel is near fine with no cracking. Auction closed on Wednesday, February 6, 2013.